Oh yes, I did henna+indigo. Now, I do love henna, but the jury is still out on the indigo part. My hair is darker, not super jet black, which after the fact I am kind of glad it's not. I understand that getting that super black color with indigo requires a cumulative build-up of it. Meaning, I would have to do it several times for it to "build up". Well, I don't think I will be doing this. I feel like the indigo was just a bit too messy. I may just stick to Natural Instincts which fades slightly over time, and also gives me the option of lightening it, if I get the whim. I co-washed in the shower and detangled with a wide tooth comb. I rinsed out the conditioner and once out of the shower, I reapplied the TJ's conditioner through my hair lightly. Second, I applied coconut oil throughout my hair. Third, I applied a dab of the Eco-Styler through my hair in 4 sections. I finished off by applying a dab of castor oil to the ends. 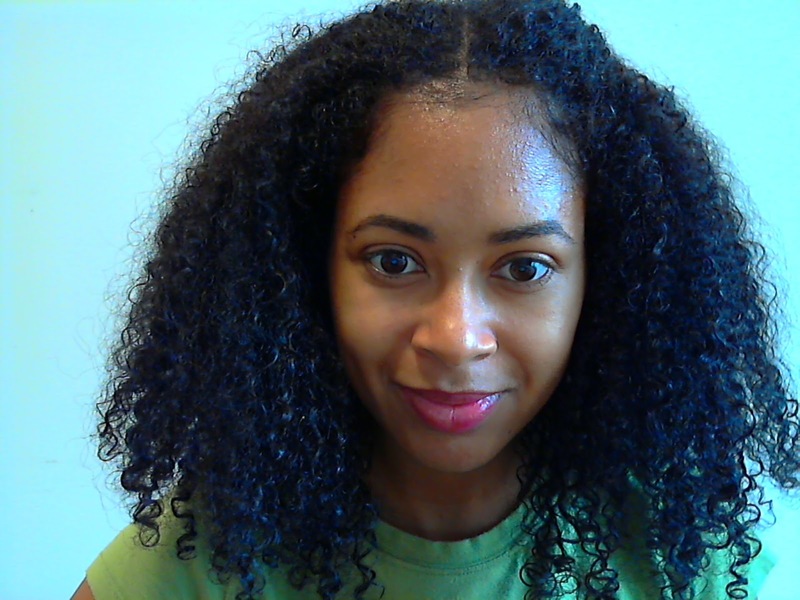 Next, I diffused my hair on medium heat (warm) for about 15 min, leaving it to airdry the rest of the way. And this is what I got. As you can see, I pinned my bangs back with 2 small clips. My bangs aren't quite at the length I want them to be for me to wear the "curly bangs" look. Also, I only used the wide-toothed comb IN THE SHOWER. I do not comb through my hair at all once out of the shower as I feel it disturbs the curls and the "clumping". Gorgeous! your hair looks very healthy Nik! Cute! Yes I have been on the castor oil kick cuz it's friggin cold out!